A Radar Chart is a chart which plots the values of each item along a separate line that starts in the center of the chart and ends on the outer circle. Let’s start to create a Radar Chart yourself step by step. You will have possibility to improve it by adding additional functions and properties. In the beginning, make some preparatory steps. 1) Select data of any available format to present it in your chart. In our example we will use Sales Information of two small companies in JSON format. 2) Insert an HTML container to your page. It will contain your future chart. For example, use name "chart_container". 3) As the next step, set the chart type. 4) Define 'chart_container' in the container property to set the chart container. 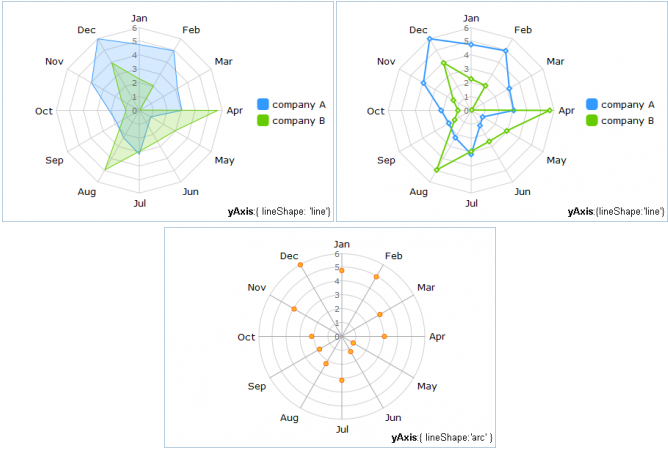 5) Assign '#companyA#' to the value property to set data that Radar Chart will represent. 6) Specify points tooltip e.g. value '#companyA#' (property tooltip). 7) Specify the alpha property to make your chart some kind of transparent. 8) Set color and width for lines that will connect items values. Our values are '#96B0B8' and '1' (attributes 'color' and 'width' of the line property). 9) Name xAxis and choose scale data (attribute 'template' of the xAxis property). 10) To present scale circles as arc lines, specify the yAxis property and the lineShape attribute in it. 11) To fill the chart area with background color, enable the fill property and set the desired color of background through the color property. 12) As we are filling the chart area, it will be better to not display items markers on the chart. So, set the disableItems property to true. 14) Use method parse() to process data.